Breast cancer awareness is personal for Catholic High School junior Gabriella Polsinelli. Her aunt, Maria Polsinelli, died of the disease four years ago after lengthy illness. Three years prior to Maria’s death, Gabriella began taking part in the Susan G. Komen Maryland 5K Race for the Cure, raising money for breast cancer research. The parishioner of St. Clement Mary Hofbauer parish in Rosedale has raised $34,000 through friends, family and current and former teachers. She’s been one of the race’s biggest money raisers. “I don’t want to see anybody else go through what my aunt went through,” Gabriella said. 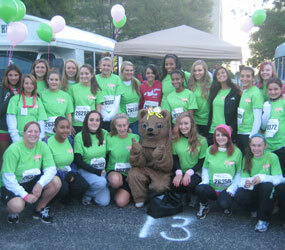 This year, Gabriella got all-girls Catholic High involved, securing 97 entrants for the Oct. 2 race in Hunt Valley. The school’s team raised more than $15,000, more than $9,000 of which came from Gabriella’s efforts. The total was the most of any new school team this year. Catholic High’s president, Barbara Nazelrod, said she was proud of Gabriella for creating a school team. Athletic director Kari McBride’s great-grandmother and grandmother were both treated for breast cancer. Gabriella’s spirit was inspirational to McBride.